Lake Tapps is an unincorporated community that is considered to be part of the city of Bonney Lake in Pierce County, Washington. However, the community has a population of nearly 12,000 people and is, naturally, situated on a large lake of the same name. 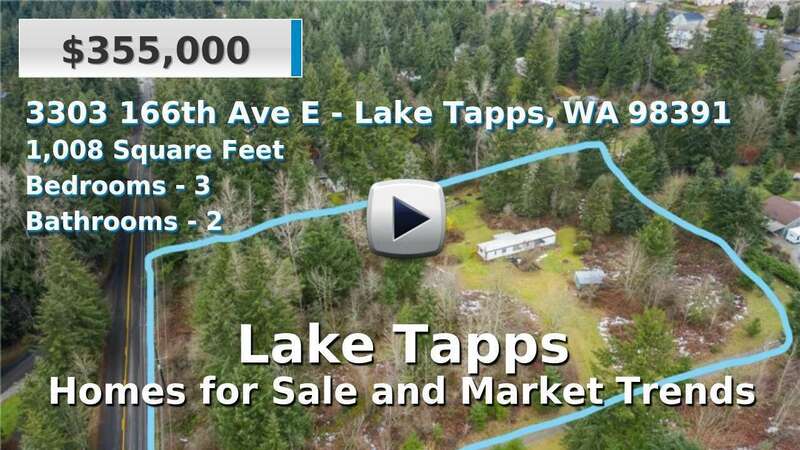 Homes for sale in Lake Tapps are newer, on average, than both the county and the state. It is a fairly suburban area located just east of Puyallup, Federal Way, and about 30 miles south of Seattle. 3 Beds | 3 Baths | 2675 sq. Ft.
4 Beds | 2.5 Baths | 3124 sq. Ft.
4 Beds | 3 Baths | 2629 sq. Ft.
4 Beds | 5.5 Baths | 4900 sq. Ft.
5 Beds | 2.75 Baths | 2958 sq. Ft.
3 Beds | 3 Baths | 3093 sq. Ft.
3 Beds | 2.5 Baths | 2189 sq. Ft.
4 Beds | 6.25 Baths | 10887 sq. Ft.
4 Beds | 4.5 Baths | 6587 sq. Ft.
3 Beds | 2.5 Baths | 2829 sq. Ft.
4 Beds | 2.5 Baths | 2960 sq. Ft.
4 Beds | 2.5 Baths | 3024 sq. Ft.
3 Beds | 2.5 Baths | 3060 sq. Ft.
3 Beds | 4.75 Baths | 6500 sq. Ft.
3 Beds | 2.5 Baths | 2178 sq. Ft.
4 Beds | 3 Baths | 3016 sq. Ft.
4 Beds | 2.75 Baths | 2422 sq. Ft.
4 Beds | 3.25 Baths | 5729 sq. Ft.
3 Beds | 2.5 Baths | 2497 sq. Ft.